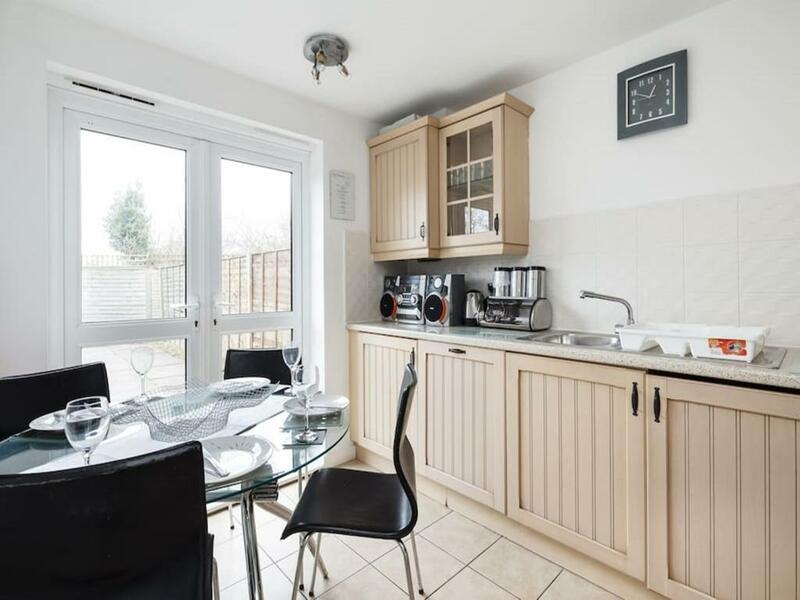 With views of the Pennines, this serviced town house provides free Wi-Fi, a modern kitchen and a spacious living area. Manchester’s centre is a 10-minute drive, or the tram network is just a few minutes’ walk away. My-Places Senior Executive Serviced Accommodation features a 42-inch HD TV with Sky HD and stylish décor in the living area. The master bedroom has a TV and a sleek private bathroom, whilst there is also a second bathroom. Opening onto a garden with a barbecue area, My-Places’s kitchen includes a fridge/freezer, oven and kitchenware. Guests can also request an airport pick-up service. Manchester Fort shopping centre, which also has restaurants, is 0. 5 miles away. Woodlands Road Tram stop provides regular 5-minute links to the city centre’s Victoria Rail Station. Depozyt na poczet zniszczeń w wysokości GBP 300 jest wymagany. Gospodarz pobierze opłatę 7 dni przed przyjazdem. Opłaty dokonuje się kartą kredytową. Zapłacona kwota powinna zostać zwrócona w ciągu 7 dni od wymeldowania. Guests will be emailed with booking arrival information, so are advised to provide a personal direct email address as part of the booking process. Bookings with at least 7 days in advance and for a minimum of 7 nights, will get a free airport pickup service (maximum 4 guests) and continental breakfast is free for the first day, subject to availability and by prior arrangement. You can use the Special Requests box when booking, or contact the property directly using the contact details provided in your confirmation. Please note that check-in before 15:00 or after 18:00 will incur a surcharge from GBP 20 to GBP 60, depending on arrival time. Please note that check-out between 11:00 and 15:00 will incur a surcharge of GBP 40. This property uses bank transfer as one of its payment methods. Prior to arrival, the property will pre-authorise the credit/debit card in the amount of GBP 300 per apartment. This is not a charge and it will be released following an inspection of the apartments. Please note the property requires the card holder to be present and staying with the party, in order to verify the card details supplied at the time of booking. Jest to apartament wyposażony w pralkę, kuchenkę mikrofalową i zmywarkę. na miejscu (nie jest konieczna rezerwacja) w cenie 15 GBP za dzień. dzieci do lat 10 – pobyt bezpłatny, jeżeli śpią na obecnych łóżkach. dzieci do lat 2 – opłata w wysokości 10 GBP za osobę, za dobę, na łóżeczkach niemowlęcych. Twoje doświadczenia bardzo pomagają innym podróżnym. Oceń w skali od 1-5 wyposażenie z którego skorzystałeś podczas pobytu w hotelu My-Places Abbotsfield Court Townhouse 14 oraz wyraź swoją opinię. Twoja opinia jest ważna! Oświadczam, że niniejsza recenzja jest oparta na moich własnych doświadczeniach i przedstawia moje rzeczywiste zdanie na temat tego hotelu (My-Places Abbotsfield Court Townhouse 14). Potwierdzam, że nie mam powiązań osobistych ani służbowych z tym obiektem oraz że nie czerpię korzyści finansowych ani żadnych innych w związku z napisaniem niniejszej recenzji.